Making craft cocktails doesn’t have to be hard! A simple way to add some extra kick to your cocktails is with an infused simple syrup. This ginger simple syrup turns everyday cocktails into unbelievably delicious cocktails! Even better, it’s ready in about 30 minutes, and all you need is sugar, water and ginger! Have dreams of becoming a craft cocktail mixologist or just looking for an easy way to jazz up your cocktails? 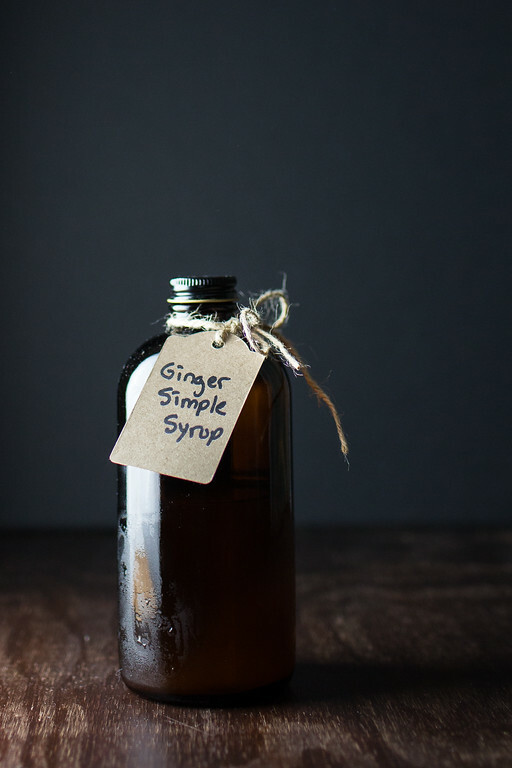 Then look no further than this ginger simple syrup. I fell in love with infused simple syrups with Rosemary Simple Syrup and Thyme Simple Syrup. Now I have another love. I think this ginger simple syrup may be my favorite. It adds such an elegant touch to cocktails. I also imagine that it would be heavenly in hot tea! Making a ginger simple syrup is so easy. You are basically making a simple syrup and including some coarsely chopped ginger. Most simple syrups are a one to one ratio of water and sugar, this one is not as sweet as most. It uses one and a half cups of water to half a cup of sugar. If you want yours sweeter, you can increase the sugar, but I would suggest that you try it this way first. You combine your water, sugar and coarsely chopped ginger into a saucepan. Bring it to a boil over medium high heat, stirring to dissolve the sugar. Then you lower the heat and let it simmer for 20 minutes. Take it off the heat and let it cool to room temperature. Then strain into a jar and store in the refrigerator. We make our own tonic water, so I use the jars from these Jack Rudy Cocktail Syrups. My favorite way to use this syrup is in cocktails. You can use it in any cocktail that calls for a simple syrup – like a French 75 Cocktail or a Hemingway Daiquiri. You can also stir some into a cocktail that doesn’t call for simple syrup like a Strawberry Martini – the strawberry ginger combination would be amazing! It’s amazing stirred into hot tea or iced tea! I’ve also drizzled it over ice cream and pound cake. Once you make it and taste how good it is, you’ll come up with all sorts of ways to use it too. If you make this Ginger Simple Syrup, be sure and let me know what you found to use it on! Kick up your cocktails with this easy infused simple syrup. Place all the ingredients in a small saucepan. Heat to a boil over medium high heat, stirring to dissolve the sugar. Remove from heat, let cool to room temperature, strain into a jar and refrigerate. This was originally posted in 2016 and has been updated for 2018. Thanks Pam for sharing the small things that bring great pleasure. It’s perfect for winter sipping. Saw this on IG and had to come and get the recipe. Can’t wait to try this in tea. It’s so good! Thanks for coming by from Instagram! What a simple but easy and delicious recipe!! Ginger is great for you, I believe and I love that you can use this in cocktails. How very fancy!! I love the idea of adding ginger to simple syrup – genius! I am such a ginger fan, I love the idea of adding a little ginger zing to drinks with this! This sounds so great for cocktails!!! That sounds like an awesome pantry staple I never knew I needed! I can definitely see so many ways to use this syrup, especially in baking 🙂 thanks for the great idea! With today’s temps hitting 45 degC, a bottle of this syrup to make some iced tea would be most welcome. Wow, this sounds like a powerful syrup 🙂 This could even double as a cough syrup! Thanks for sharing at the Friday Favorites linky party. I hope you’ll come back next week to link up your projects so I can stop by again! I love ginger especially wrapped in luscious dark chocolate. Excuse me I just have to go and . . .